Ah how I relish the Monday rest day! Alas on Tuesday I was still pretty knackered. The planned run was 60 minutes, 30 easy, 30 faster. The 30 faster was only infinitesimally faster (if at all) than the easy bit. Still, it was done and no harm other than tiredness. Oh, I forgot, I was also exceptionally hot which didn’t help. Wednesday is always a track day, although I haven’t actually been to the track for ages as it has been being used for school sports days. Thankfully the temperature had dropped from Tuesday’s 30+ to an acceptable 18 or so degrees. The session was 2k @ 10k pace then 8 x 400 metres. I chose Preston Park as the first 2k could be the first 2km of parkrun, then the 400s could be along the straight at the bottom. I measured a 400m stretch on MapMyRun. Rob had discovered an almost exact replica of this 400m from his past training. He joined me for this which was another reason to do it in Preston Park as he can just roll down the hill from his house. I hoped to do the 2k in 8.24 which would be 42 minute 10k pace and we finished in 8.30 so that’s ok seeing as I haven’t actually run a 42 minute 10k recently. The 400s were to be between 96-100 seconds (20 minute 5k pace). After a 95 and a 94 for the first two the rest were 91s. Rob was a few seconds faster for all of them. A successful session. A welcome, nice easy 45 minutes on Thursday. Friday was supposed to be a “steady” 30 minutes with 4 x 15s strides. I think I may have done this too fast. It felt fine, though hard, at the time and the strides were good too. 7.08 average for the 4 miles over all. 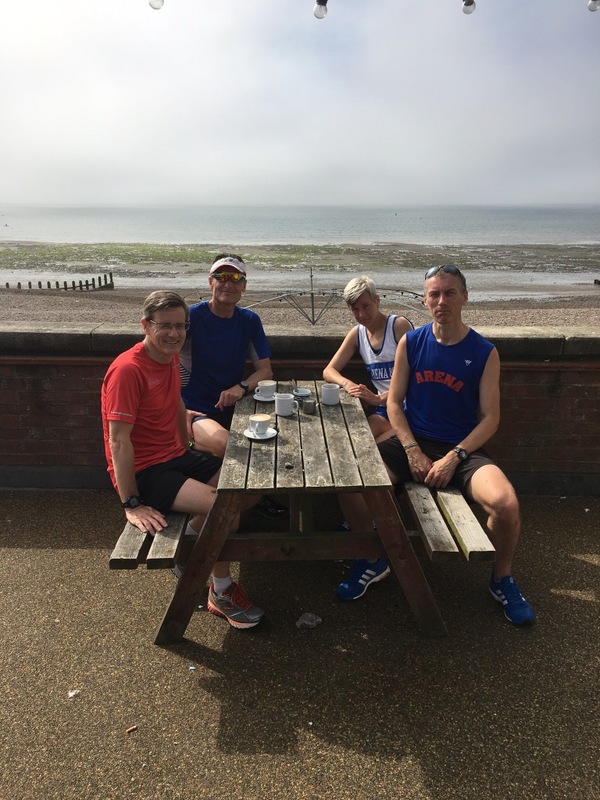 Because the weather forecast was clement and because Worthing parkrun is a good course we took ourselves over there on Saturday for a slight change of scene. 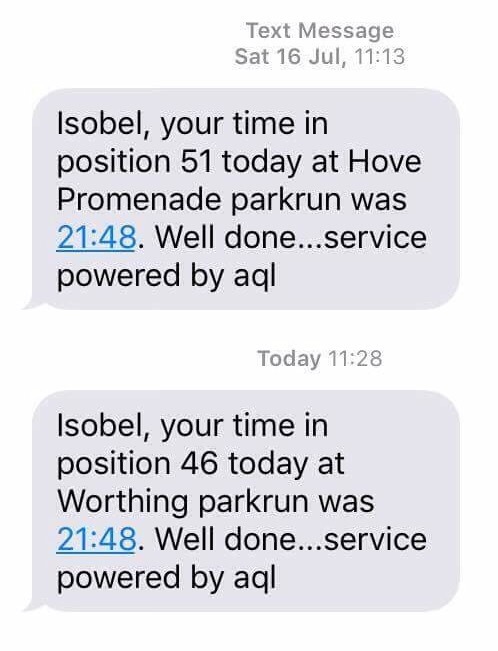 My accidentally too fast Friday put paid to my hopes of parkrun speed, along with the heat, but I was mainly there for the trip and the roof terrace. Consistency is key and you can’t get more consistent than that. Today (Sunday) was my favourite run of the week. I have officially lost my mind. Who would have ever thought I would want to do a hilly long run? I think I like it because I feel like I’m getting a lot done in one run. This is also precisely why I got myself a coach. I want to be told what to do because then I’ll do it no matter how much I might not want to and look what’s happened now I’ve done these for a few months; I actually like doing them (not that this stops me from procrastinating wildly before dragging myself out). Today I did the usual 90 minute hilly loop with 5, 4, 3, 2, 1 minute faster reps in the middle. Everything was much the same as usual but for some chafing. This is the only bit I can show you! 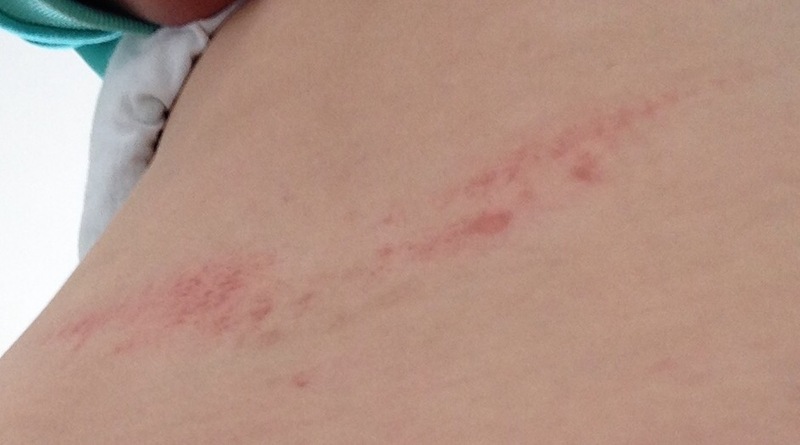 Over the course of the week I notched up 33 miles and three new and unexpected chafed areas. I must remember I am in the “hard work” phase of training so will be tired and slower than when fresher (in August). I have had hay fever or a cold this week with lots of sneezing/sore throat which has made me feel more tired. I ran two of my best 10ks for years within a few days of each other a week or so ago so that will also contribute to my tiredness. Dodgy ankle(s) from lots of hills/races/spikes not helping.